Salehi did not provide any specific details on the new generation of centrifuges. 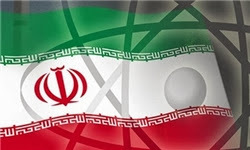 The interim agreement signed last month in Geneva between Iran and P5+1, and valid for six months, prohibits the introduction of new centrifuges by Iran. It was not clear if Iran plans to manufacture the new enrichment machines after the expiration of the Geneva agreement. If this plan goes into action it would equal a self-inflicted death knell by the occupying terrorists in Tehran. ...or if, failing an agreement with the West on the nuclear issue, the Iranians intend to leap ahead again with their nuclear technology, as happened ten years ago following the Paris agreement. Obviously the Iranians are signalling future consequences should negotiations lead to a similar letdown. They weren't bluffing in '03 and most likely they're not bluffing in '13. Fine, hope they do...they will bare the consequences. With a few weeks of massive bombings, this filthy regime's entire nuclear infrastructure could be shut down -- along with any filthy terrorist who dares look the wrong way at the planes doing the bombing. The U.S. needs to stop wasting time with a country of liars, and put them in their place. The main target of Salehi’s announcement is the country’s own hard-right. Rouhani’s administration has been under intense pressure from the right from the day it signed the Geneva agreement. Some leading conservatives have criticized the agreement for giving in too much to the West, sometimes accusing the government of surrendering the country’s national interests. 100 MPs have also put forward a proposal at Majlis to force the government to enrich uranium at 60%, apparently if the interim agreement is not followed. Those are the very MPs who are arguing that Iran gave in to the West. The question would be why then the West wants to renege on an agreement that is so one-sidedly in its favor, as they argue. Salehi perhaps is trying to pacify the criticism somehow. Let’s hope cooler heads prevail and the agreement is implemented fully, opening the way for a permanent agreement at the end of the six-month period. Rouhani’s new government and the country cannot afford to lose this opportunity. Let’s hope ’13 is different than ’03! no, if u read the news you will find out that even the permanent deal is not really permanent and Iran and P5+1 are negotiating for its length (Iran want it to be around 10 years and US 30 years) after this period Iran will be free to do whatever another country under NPT can do which includes installing new type of centrifuge, And in the mean while Iran can develop new technologies anyway. Well said 9:11! I fully share your sentiments! Lots of commentators in this forum oppose that horrible regime! And there are millions like us in Iran not even allowed to utter so much as a beep without risking their lifes. People who post comments here in the defense of this criminal & oppressive regime, while living comfortably in Europe or the US, are hypocritical morons, plain and simple. The rantings of the same bunch of pahlavi fans and traitorous greenies who want to see iran reduced to just another arab style dictatorship vassal state like saudi,bahrain or egypt. Ahmadinejad was a key culprit of ruining the talks when he came to power in '05. Rouhani/Zarif team on one hand, and Obama/Kerry/Hagel team on the other, are much more wiser and reasonable and present the best chance ever to have a deal struck by the two sides. bombings are a last resort and the United States is well-advised to avoid any such action while there's a chance to reach an agreement. we can assume that there are Iranians who are not foolish enough to allow their nation to be bombed because Iran's government is reactionary and inept. Standing up for a nations sovereign rights is "reactionary and inept"?? Unfortunately, there are not enough Americans who are not foolish enough to allow their nation to be dragged into another useless war they pay for with their lives and money.